CANCELLED – we are sorry to inform you that dear Lakshmish is not able to come as EU-visa has not been issued! 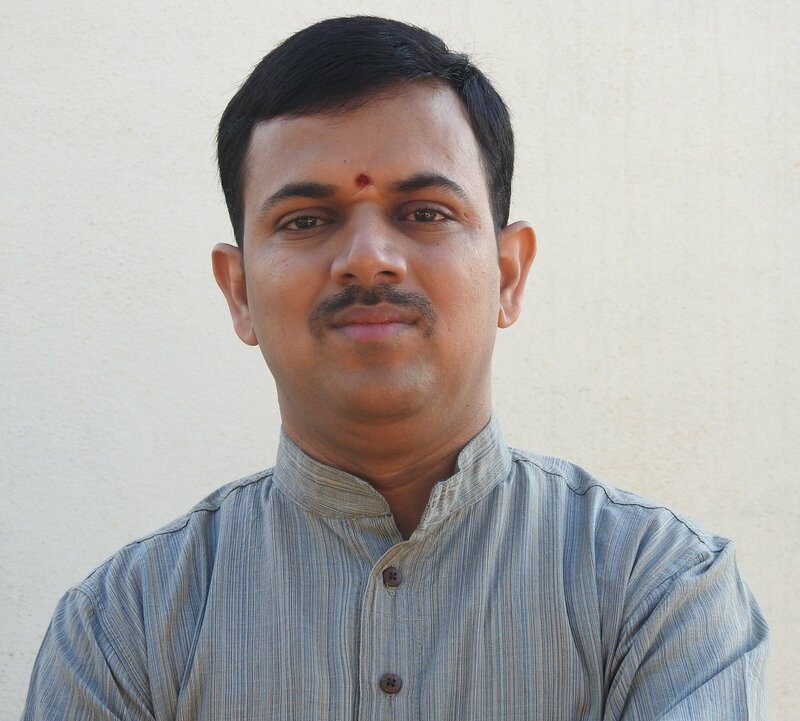 Vidwan Lakshmish Bhat from KPJAYI in Mysore will be visiting our shala from 10th to 13th of May 2018. He will give lectures of chanting Astanga yoga mantras and explanations of the yoga text Hatha Yoga Pradipika which forms the basic for yoga practitioners. 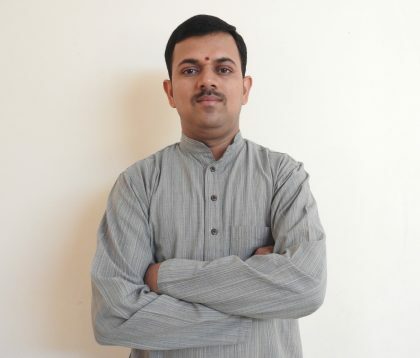 Lakshmish is the teacher of Sanskrit, Chanting and Philosophy incl. the Bhagavadgita at the renowned Vidwan Shri K. Pattabhi Jois Ashtanga Yoga Institute (KPJAYI) in Mysore, India since 2003. Karnataka in India into a Brahmin family of very humble circumstances. He studied Sanskrit by the traditional method in his village for continuous 8 years and in the year 2000 he came to the Mysore Maharaja Sanskrit College for further studies of Advaita Vedanta. He has obtained the Vidwan title also in that subject and subsequently received a master’s degree from Mysore University in 2006. In 2006 he married Ranjita and have a son, Gautama who is now 10 years old. Lakshmish also conducts the traditional Brahmin puja rituals every day in his home and at the yoga shala for the benefit of the students and the family, as part of his work at KPJAYI. Lakshmish will also be visiting Stockholm, Bruxelles, Budapest and Duisburg. 12-14 Welcome with Ganesha puja- Open for all, donations welcome! – basic chanting and explanation of mantras the mantra means, history of astanga yoga mantra, asana and numbers. 12-14: Hatha Yoga Pradipika – what is this yoga text about and what does it mean in the Indian tradition of Yoga, including chanting of verses especially from the 1st chapter. 14.30-16: Hatha Yoga Pradipika – the basics for a practitioner of yoga including the relationship between teacher and student, guru-śiṣya, parampara and the significance of this in Indian view. Hopefully with a few stories of Lakshmish’ experiences in Mysore. 12-14: HYP more selected verses, chanting and explanations. 15-16: Chanting of mantra – astanga yoga, asana names and numbers. All lectures with Lakshmish 500dkk by sign up before May 1st (after 600kr) or 1 single day 250dkk. All classes with Lakshmish and yoga with Susanna 1000dkk. Payment to our account and please remember to cover all fees also receivers and mark “Lakshmish” – if you choose EU-transfer, sharing transfer fees, then add 50dkk to cover receiver’s fee!